Starting this route from Camprodon, the first stop is in Sant Joan les Fonts. It is the second municipality of the region, gathering three villages. It is the junction between different roads, especially some going to the mountains. 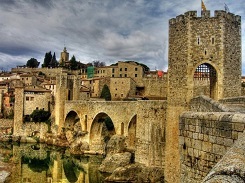 Three main monuments to see; Sant Joan Monastery, fortified Juvinyà castle and the medieval bridge. The monastery was declared an Asset of National Cultural. This typical Romanesque church has pink walls and on one side of the walls, a carved stone block coming from the previous Visigoth temple. The fortified Juvinyà Castle is also a great medieval heritage. It was built during the 8th-9th century. The different families owning the area set their residence here, from the Fonts family until now. It has been renovated to welcome, nowadays, a permanent exposition. The medieval bridge was erected during the 8th century, with volcanic rocks, a common material in the area and easily accessible. Located near the church of Sant Joan les Fonts, it used to connect the Pyrenees to the Catalan coast. To continue the route, let’s go to Castellfollit, about 5 minutes drive from the previous village. It is located on the top of a basalt cliff. The view is pretty impressive, with the cliff and the river located below. It is so atypical, you can just walk around and enjoy the view from there. Then, head to Argelaguer, about 10 minutes from the last stop. This village is more classical, though, you will find some medieval buildings, like Capella de Santa Anna, a roman chapel, the Palau dels Montpalau, a fortified medieval house or the castle de Montpalau, which had a intimidation fonction towards the strangers. This castle was not meant to be inhabited. Nowadays, it is pretty damaged, but you can still see a main tower, the perimeter of the castle, interior walls. This route ends in Besalù, one of the most famous town of the area. Its name come from the latin “Bisuldunum”, meaning a castle on a mountain, between two rivers. It used to be the capital of La Garrotxa. It is declared National Historic-Artistic Ensemble as it is the best preserved medieval town of Catalonia. The must see here is the Viejo Bridge, constructed (and demolished and reconstructed) between the 11th and 14th century. It was part of the defensive fortification and was also a toll bridge. If you want to capture the whole beauty of it, go see it by night! This town really seems to be stuck in time, as is the Medieval time never ended. You can also visit the Casa Cornella, a medieval manor house, built during the 12th century. It is a typical example of Catalan Romanesque civil architecture. Plus you can go to La Cúria Reial, the royal court, where you will learn more about Besalù history thanks to video. The arches inside the building are impressive. FInally, the St Julia of Besalù Church Hospital, founded by Count of Besalù during the 12th century. It was meant to welcome the people in pilgrimage, it was managed by the Benedictine monks. For your interest, the city also has a valuable Jewish heritage, especially with the Miqve, old Jewish bath and the Synagogue. La Garrotxa is a region worth visiting, between its medieval heritage and natural wonders, you can not get bored! Enjoy your stay in our family hotel in La Garrotxa.